OK, maybe not truly blond, but a lovely light color that photographed well. Measuring only 31 inches long, with a maximum width of 15 inches (at the very top), and a depth of 5.5 inches, this piece epitomizes the concept of a dwarf serpentine. And, to make it the best of all worlds, it is Viennese, with a perfect dial, exquisite hands, and one of the nicest examples of calligraphy I have seen for the makers name. Karl Marttin is listed in Claterbos as having his shop at Lindehgasse 17 in 1961. He was no longer so listed in 1893. The bob is zinc backed, as appropriate for a Viennese piece of the 3rd quarter of the 1800s, the case has a truly fantastic finish, under all that grime, and has its original wall stabilizers. The only flaw on this piece is the crack to one side of the top of the door. But, it is very clean, and will pretty much disappear when I fix it. Cracks like this are almost fun to fix – having done it so many times. One simply removes the piece of wood behind the crack, shortens the removed piece by a small amount, and put it back together. The mechanism is one of the little gems the Viennese are so very noted for – and will be a true joy to go through. Note too the perfect beat scale, and the very fine detail to the hands. 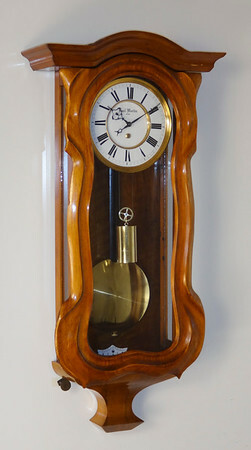 While this clock is one of the less expensive clocks on this site, please realize – we only bought clocks like this if they were in truly exceptional condition, and represented a finer than typical quality. This dwarf will be a beautiful example of the genre when finished. It is always amazing to me how the clocks that come to me the dirtiest come out the best - likely because the layers of dirt and grime protect the finish from sunlight and oxidants in the environment. Whatever the case, this piece came out beautifully!